355 Marlborough is located on the north side of Marlborough, between Gloucester and Hereford, with 353 Marlborough to the east and 357 Marlborough to the west. 355 Marlborough was built ca. 1872 for builder and contractor George Martin Gibson, for speculative sale, one of eleven contiguous houses (337-339-341-343-345-347-349-351-353-355-357 Marlborough). Click here for an index to the deeds for 355 Marlborough. On November 15, 1873, 355 Marlborough was purchased from Hiram Gerrish by Joseph McIntire, a wholesale provisions (produce) merchant in partnership with Elbridge G. Knight in the firm of Knight & McIntire. 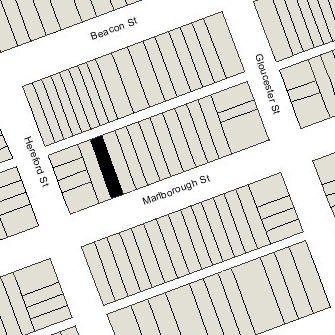 On the same day, Hiram Gerrish also sold Joseph McIntire 337 Marlborough, 345 Marlborough, and 357 Marlborough, and sold Joseph McIntire and Elbridge Knight, as partners, 347 Marlborough and 351 Marlborough They purchased the houses as rental property or for re-sale. On May 25, 1875, 355 Marlborough was purchased from Joseph McIntire by George Warren, a ship owner and shipping merchant in the firm of George Warren & Co., operators of steamships between Liverpool and Boston. His principal residence was Strawberry Field in Woolton, Lancashire, near Liverpool (the house later became a Salvation Army home for children and was made famous by The Beatles in their song, “Strawberry Fields Forever”). By the 1875-1876 winter season, 355 Marlborough was the home of John Russell Williams and his wife, Isabel Louise (Thaxter) Williams. They previously had lived at 21 Joy Street. John Williams was an insurance broker and later an adjuster. Isabel Louise Williams was the sister of Samuel Goff Thaxter, employed in the Boston office of George Warren & Company (at the time of the 1861 British Census of Lancaster, England, Samuel Thaxter was enumerated as a visitor living with George Warren and his family). George Warren died in October of 1880 in Bellagio, Italy. In his will he left his property, including 355 Marlborough, in trust for the benefit of his six children: Mary Warren, George Hignett Warren, Charlotte Thaxter Warren, Frederic Warren, Henry Percy Warren, and Edith Emily Warren. John and Isabel Williams continued to live at 355 Marlborough during the 1884-1885 winter season, but moved thereafter. On April 30, 1885, 355 Marlborough was purchased from the Warren trust by Harriet (Harriette) (Day) Putnam, the widow of Judge John Phelps Putnam. Their daughter, Ellen Day Putnam, lived with her. They previously had lived at the Hotel Vendôme and, before that, at 60 Commonwealth. Harriet Putnam died in February of 1894. In her will, she left her residuary estate, including 355 Marlborough, in trust for the benefit of Ellen Putnam, who continued to live at 355 Marlborough. In 1899, Ellen Putnam was joined at 355 Marlborough by her brother-in-law and sister, Robert Swain Peabody and Annie (Putnam) Peabody. 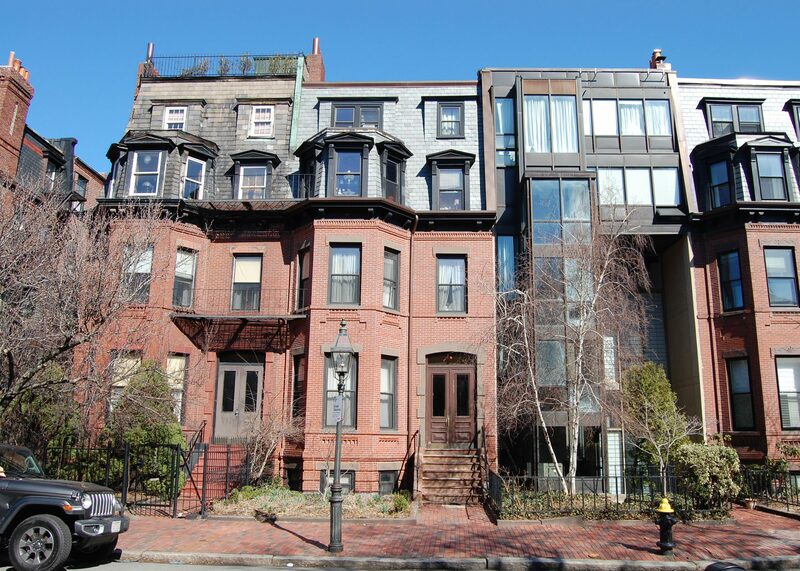 He was an architect; his firm, Peabody and Stearns, was among the foremost architectural firms in Boston and designed a number of homes in the Back Bay. They previously had lived in Brookline. By the 1899-1900 season, they had moved to 354 Beacon. Ellen Putnam continued to live at 355 Marlborough until during the 1912-1913 winter season, but moved thereafter. On April 2, 1913, 355 Marlborough was purchased from Ellen Putnam’s trust by Alice Woodward (Brown) De Normandie, wife of Dr. Robert Laurent De Normandie, an obstetrician. They lived at 357 Marlborough and he used 355 Marlborough as medical offices. The same month she acquired 355 Marlborough, Alice De Normandie applied for (and subsequently received) permission to construct a rear ell containing a two-car garage with a studio and laboratory above. The remodeling was designed by architects Putnam and Allen. In August of 1916, she applied for (and subsequently received) permission to cut doors between 355 and 357 Marlborough on the third floor. The De Normandies lived at 357 Marlborough until about 1928, when they moved to Lincoln. He continued to maintain his medical offices at 355 Marlborough. 355 Marlborough continued to be primarily medical offices, with a live-in janitor (Clifford Wiles in the early 1930s and then Joseph Hannah). By 1934, 355 Marlborough also had become the home of the De Normandies’ son-in-law and daughter, Dr. Oliver Cope, a physician and surgeon, and Alice (De Normandie) Cope. They had married in 1932, and in 1933 he had received a Moseley Traveling Fellowship which enabled them to travel to Europe, where he continued his medical studies briefly in Berlin and then in London. Among his specialties were diseases of the thyroid and the treatment of severe burn victims. Alice Cope was co-founder of the Window Shop in Cambridge, established to provide employment opportunities for refugees and raise funds for children’s education. Dr. Cope maintained his medical offices at 355 Marlborough along with Dr. De Normandie and several other doctors. 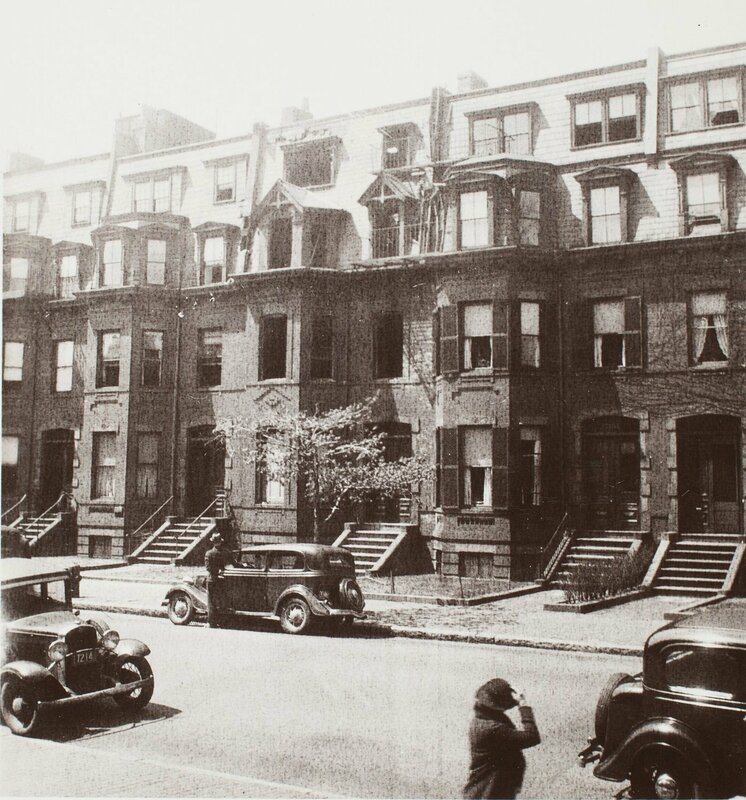 On May 7, 1935, the house was damaged by a fire which destroyed 353 Marlborough. The Copes continued to live at 355 Marlborough — and he continued to maintain his medical offices there with Robert De Normandie and others — until about 1937, when they moved to Belmont. On August 24, 1954, 355 Marlborough was acquired from the Nursery Training School by Aileen Susan Frances (McAneney) Clarke Venezia, the wife of Eugene J. Venezia, a contractor. They lived in an apartment at 470 Beacon. On the same day, 357 Marlborough was acquired from the school by Maureen (Mary) Bernadette Clarke, Aileen Venezia’s daughter by her first marriage, to Patrick Clarke. On November 12, 1954, 355 Marlborough was acquired from Aileen Venezia by real estate dealers Stuart H. Hastings and Joseph A. Gautreau. That same month, Stuart Hastings filed for (and subsequently received) permission to convert the property from a school and dormitory into ten apartments. On June 15, 1955, 355 Marlborough was acquired from Stuart Hastings and Joseph Gautreau by Dr. Francis Donald Peters and his wife, Margaret (Masters) Peters. He was a physician in Somerville. Their son, Francis, Jr., an insurance agent, lived in one of the apartments. On November 15, 1957, 355 Marlborough was purchased from the Francis and Margaret Peters by Edward Charles and his wife, Estelle (Waldman) Charles. They lived in an apartment at 184 Marlborough and then at 106 Marlborough. On October 10, 1960, 355 Marlborough was purchased from Edward and Estelle Charles by real estate dealer Mark Romeo Gellis. On May 2, 1977, 355 Marlborough was purchased from Mark Gellis by real estate dealer Patrick J. Glynn and his wife, Anne T. (Kelly) Glynn. 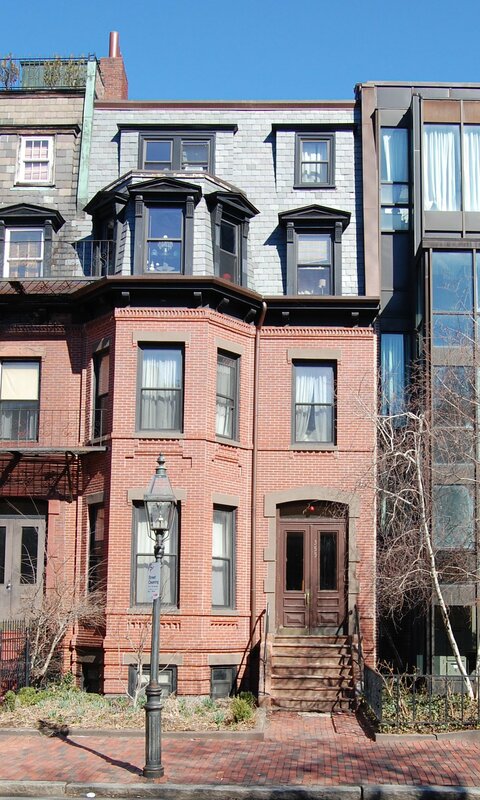 On April 28, 1987, the Glynns converted the property into ten condominium units, the 355 Marlborough Street Condominium.